What’s on your feet? All through history, there have been civilizations that have run around their whole lives bare footed. I’m not one of them. I like shoes. Especially in an emergency, shoes protect your feet from injury that can be incurred through unstable walking surfaces and debris on the ground. They will help you walk farther and faster than you could with your bare feet. 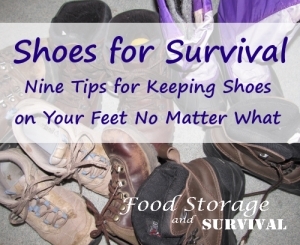 Shoes are an important part of your preparedness plans. Here are nine tips to keep shoes on your feet no matter what happens. 1. Own a good pair of walking or hiking shoes. Many of us, especially women, own plenty of shoes that are not well suited to walking long distances. You want a pair of shoes that are built for walking. Look for shoes that support your feet, arches, and ankles. In a hiking boot, leather will last longer than “all man made materials”, plus leather shoes will also conform to your foot over time, making them the more comfortable choice. A good pair of shoes can set you back a chunk of change. You may be able to get some with less money by checking ebay, thrift stores, or yard sales. Make sure there’s enough life left in the shoes to justify the cut price. I generally only purchase used if they are next to new so I get a shoe that has not conformed to the foot of someone else and has plenty of wear left in it. 2. Own enough of these to last you at least two years. As if one pair weren’t enough! A long term disaster or financial setback could keep you from purchasing shoes for an extended time. One good pair of shoes will last at least a year–I’ve had some last longer, but it’s a good idea to have a second pair ready before the first pair starts wearing out. 3. Stock shoes for your children. As children grow, so do their feet. Keep a supply of shoes that are “next size up” for your kids. You may even want the next two or three sizes, depending on how quickly they grow. You can get these inexpensively at yard sales, thrift stores, or ebay. Again, look for sturdy, well built shoes. I keep them in a box waiting for the kids to grow. Your kids don’t have to love the style. You may never even use them. Think of them like insurance–for about five dollars a pair your kids will have shoes if they need them. If they skip through that size or won’t wear them, you can always resell them and recoup part of your costs! 4. Stock seasonal shoes. Do you live in an area that gets very hot or gets cold and snow? Keep shoes or boots on hand for those seasons. Remember the kids here as well. A decent pair of snow boots rarely gets used enough before a kid outgrows them, so these can also be found frequently at yard sales and thrift stores. 5. Retire shoes before they are worn out. If your shoes still have life left when you replace them with new shoes, they can be used to stock emergency kits or car kits, and be available in the event something happens to your primary pair of shoes. 6. Keep shoes by your bed. If you’re lucky, you get to spend about a third of your life there. What happens if the emergency happens while you’re in bed? Keep a good pair of shoes that are easy to get on your feet near your bed while you’re in it and you’ll be able to evacuate without stepping on the legos in the living room! 7. Keep shoes in the car. This is especially important if you spend a lot of time away from home–at work or school. Even more so if you are wearing dressy shoes during that time. You want shoes you can comfortably walk home in. Remember those shoes you quit wearing while they still had life? Perfect for keeping in your car. 8. Keep your shoes in good condition. Shoes last longer when they are taken care of. A good leather conditioner oil for leather shoes will keep them supple. If you get into dirt and mud, get your shoes cleaned off afterward. Don’t leave them outside where weather and animals can get to them (that little piece of advice is especially for my kids). 9. Learn to make shoes. Moccasins are a quick, easy way to get started with making your own shoes. Unless you get a solid sole of some kind, the leather soles will wear through quickly if you’re anywhere but on the grass. You could also try your hand at making tire sandals. These could be strapped over a pair of moccasins and you’d be set! Remember, your feet will take you places if they’re happy. Injure your feet and you’re not going anywhere. Shoes are one piece of preparedness gear I don’t want to be without in an emergency! I just bought a pair of Merrell hiking boots for work thinking since I’m on my feet all day they would be better than my sneakers. After 2 days my feet were killing me. I love the boots but honestly if they were sitting in my trunk and I threw them on because I might need to walk 5 miles I would have probably not made it. Whatever shoes you need I would suggest breaking them in beforehand. I only work in a small store but 8 hours of uncomfortable shoes takes it’s toll, I can’t imagine miles. It was a wake up call. I was just about to add the same thing — make sure your shoes are broken in before depending on them! Don’t buy used shoes. Shoes conform to the feet of the wearer, you even pointed this out. If you wear used shoes, you will be wearing shoes that have conformed to someone else’s feet. That is begging for foot problems. I have bought a half-dozen pairs of shoes from sportsmansguide.com- and am very happy with them. Am currently making a pair of Jesus boots- sandals make from biasply tires,(not steelbelted- too hard to cut). Cut them out using a template. clamp them between two boards, and boil them until they stay flat. Straps can be paracord, or whatever ya got. (The Vietcong preferred Pirelli tread pattern for ‘fashion’ Haha- make em right and they will last for the rest of your life! 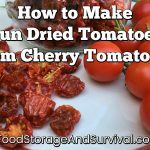 Come to think of it- you could probably sell these things at prepper websites? I am on my second pair of New Balance shoes. the ones I chose were the water resistant. They have proved the only ones that I have had that were actually waterproof. The soles are wide and give good support and long wear. The only drawback is they are a bit warm but at seventy years old I find I need the protection from the cold They run 125 dollars but lasted for two years. I typically would walk five miles a day with the dogs. They also have shoes made in America.